Whether it's the Super Bowl or just any given Sunday, there’s nothing like discovering that perfect chicken wing. From farm fresh to city served, the wings of Pennsylvania are diverse and delicious. Take a look at our top 10! El Camino Real not only offers up some of the best chicken wings in Pennsylvania, but they also feature pork and veggie wings! Whether you go just for the wings, or enjoy a pitcher of potent margaritas and a full meal, El Camino is a must-visit in Philadelphia. Big Shot Bob’s hit the Pittsburgh culinary scene in 2007, and has since expanded to six locations. With more gourmet wing options than you can count, and an array of gyros, burgers, salads, and sides, Big Shot Bob’s is the place to be for hearty, affordable dining. Alliger’s offers 26 family-recipe flavors of wings, each more delectable than the last. Visit their Sayre location, or order up to a gallon of nine select sauce flavors online. For more than 25 years, FWOT has been serving up fingers and wings, boneless and regular, in mix-and-match combinations with seriously good dipping sauces. Stop in for great wings, and a huge variety of French fries and other sides. Whether you eat-in, carry out, or order for local delivery, Joe’s Famous is one of the best wing experiences in Lancaster County. No frills and all flavor, this Leola eatery was an easy fit for our list. A State College favorite, Wings Over Happy Valley sells wings and other delicious dishes until 1 a.m.
With a huge variety of sauces and flavorings, the wings at Wings, Suds, and Spuds are unique and delicious. 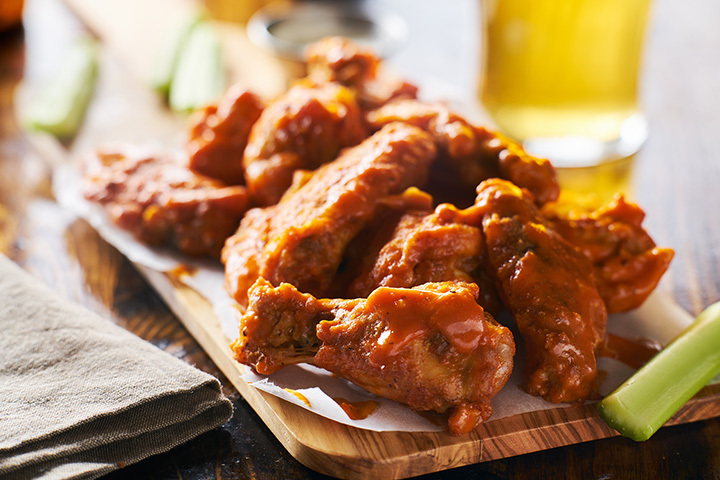 Stop in for a beer with your wings, or carry-out the 50-piece party tray. With locations in both Mifflinburg and Lewisburg, the wings of Larry’s Pizza and Subs have developed quite a following. Whether you order them regular, extra spicy, or boneless, these wings are worth the trip. With locally lauded wings served in a family friendly atmosphere, Kelly’s is one of the best options for classic wings. Visit on Wednesdays for wing specials, Mondays for discounted domestic beer, or Tuesdays for marked-down martinis. Great service and outstanding food: Paradise by the Slice has become a Wernersville go-to for quality eating at a good price. Enjoy top notch wings and Italian fare complimented by 29 draft and 150 bottled beers.